What I love about this quote with the photo I found, is the dichotomy of how part of her seems to be like the ancient stone and part of her is golden and light filled, looking like she is still alive fighting her battles. When we are fighting a desperate battle, sometimes it feels like we can’t take one more step. Like we have turned to stone. Like the internal battle between what we know we have to do (taking the next step) and how we feel (we can’t move another step) is literally dividing us and tearing us in two. Remember how far you have come, all the battles you have won, the fears that you conquered, and tell that person who is trying to bring you down to go to hell. We all have several groups or individuals who tear us down. Those well meaning friends and loved ones who don’t want to see us get hurt, so they tells us that we can’t or shouldn’t try to be successful in our chosen endeavor. That we are risking too much. That we are doomed to fail. That it is impossible, so why take the chance of evitable failure? Be the person who stays strong even when you have every reason to break down. Then there is that group that just can’t bear for someone to be successful and so they tear down others to make themselves feel better. They are too afraid to take any kind of risk that would have the potential of making them look bad. Bullies fall into this category. They can’t stand seeing someone better at something than they are, so they tear you down whenever you show any desire to have a better life or be a better person. Our greatest battles are those with our own minds. And lastly the worst group of all, our own minds. That voice inside of our head that tells us all of the reasons why we shouldn’t try. That reminds us of every failure we have had starting at birth and going forward through time to this very moment. That tells us the horror story of everyone who has tried and failed in the history of mankind. That voice that will not shut up and that we can’t escape from. It doesn’t matter how many battles we fight and lose. It doesn’t matter how many battles we have to fight over and over again. What matters is that we fought. That we learned something from it. That we not only survive the battle, but that we thrive after we have either won or lost it. I heard this analogy and I loved it. Everything comes out in the wash! Every problem that we see as something that will take us out of the battle, that seems insurmountable, think of the problem like a washing machine. The problem may twist us in a knot, it may spin us around until we lose our balance and fall down. It may knock us down the hillside, and as we roll through the mud, as the rocks cut at us, and the nettles sting us, in the end, we will come out cleaner, brighter and better than before we entered the wash. This is because “everything comes out in the wash”. Meaning that coming out the other side, meaning that whether we win or lose, we were not defeated. We are only defeated when we quit. I love this! All you have to do is watch commercials to see how profitable self doubt is. We are taught to have a “lack mentality”. The saying that you can’t be rich enough or skinny enough, or beautiful enough. That we need to spend more money on things, to have the latest cars, the latest gadget, to sculpt our bodies with surgery, to move to a bigger and more expensive home, to ask our doctor for the latest designer drugs that have more side effects than the issues they are supposed to cure. All ways to make us happy, when none of those things will make us happy. The place to start is to love ourselves and then build from that space the life that spreads that happiness out into the world. When life demands more of people than they demand of life – as is ordinarily the case – what results is a resentment of life almost as deep-seated as the fear of death. 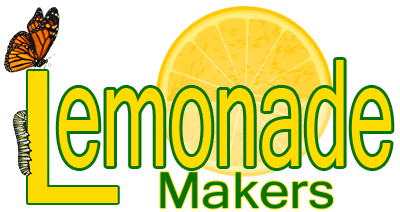 I was asked today what LemonadeMakers is all about. This quote really states it pretty well. When my nephew was murdered, and when anyone in life has such a life shattering moment occur, you really have two choices. You can demand more of yourself, and surmount the problem. If you don’t, then the second choice is defaulted to. You fall into resentment, victimhood, depression, etc. . , you stop living life and you start existing until death takes you out of life. I didn’t want our family to fall into that deep crevasse and be buried alive until they died. I wanted us to transform what had happened to us, into something that happened for us. I wanted to bring something positive out of that debilitating experience and share it with you. Successes in life come from struggles. The butterfly has to fight to release itself from the chrysalis. If you open it up, the wings become deformed and it can’t fly. We are the same. The fight to transform life’s lemons into lemonade is what strengthens us and makes the transformation more than a temporary change. When we have struggled to fight the inner demons; when we have fought the uphill battle of addiction; when we have taken step after step through the mud and swamps of personal failures – we know that we will never, ever, go back there. That we will never again, ever, allow anyone to make us feel like we aren’t worthy of a seat at the table.